Where’s the Laid-Back Fun in Kids’ Summer Vacations? Whatever happened to the lazy, hazy, endless summer? 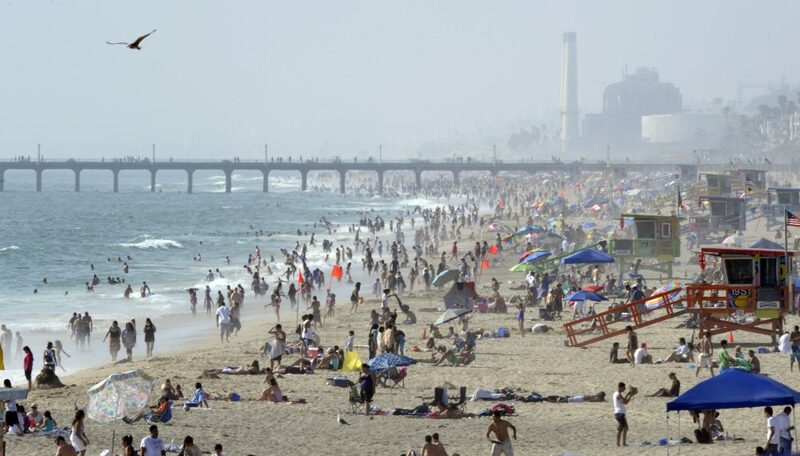 Crowds gather at the beach, July 2010, in Hermosa Beach, Calif. Photo by Mark J. Terrill/Associated Press. My grade school summer vacations seemed to last forever, pairing well with the Beach Boys’ Endless Summer double album I wore out on the record changer. During those hot and humid Northern Virginia summers, I headed each weekday to the summer camp held in my elementary school’s nearly-abandoned cafeteria. It was a low-key affair—ping pong and table hockey on the cafeteria lunch tables, kickball and football on the playground, key chains and macramé in arts and crafts—while mix tapes with Gerry Rafferty’s “Baker Street” in heavy rotation played over the school’s PA system. And in what must have been one of the greatest bargains of the 1970s, camp tuition was $20 for the entire summer. Today, such an easy-going camp would be trashed on Yelp!, despite its unbeatable price, for failing to deliver any quasi-academic or super-creative purpose. Imagine my camp competing with today’s Computer Camp, Robotics Camp, Animation camp, and (my personal favorite) New York Film Academy Camp, which is in, of all places, Burbank. Kids’ summer camps in Los Angeles enter parents’ collective consciousness around January 15, just after the three-week-long Los Angeles Unified School District (LAUSD) winter break, which was the dream of the teachers’ union (which also negotiated an entire week off for Thanksgiving) and the owners of, yes, winter camps. The most popular summer camps are said to fill up by mid-February, so the camp arms race begins before one even has a chance to plan a basic family vacation. Our daughter, now eight, is already enrolled in four camps (with a fifth still possible) so that we, her two professional working parents, can earn a living and thus afford said camps. We’re signed up for a week-long, overnight, all-girls sleepaway camp at Griffith Park, an arts camp at a synagogue three blocks away, a swimming/all-around recreation camp at Valley College, and Beach Camp, which, for our fair-skinned daughter, requires bulk purchases of SPF 50 sunscreen. There’s also the matter that plenty of LAUSD families simply can’t afford private summer camp at all, since absolutely none of them can be found at the bargain, 1970s price of $20. Half of all LAUSD families qualify for free lunch programs, meaning their household income is just over or below the federal poverty line. Some summer camps offer scholarships on a very limited basis, but that just means families in need must compete for these coveted slots and complete additional administrative paperwork. Mind you, this is on top of the dizzying registration process that often involves web sites crashing after anxious parents overwhelm the system immediately after the online enrollment period opens. … while the fabled and possibly archaic family summer vacation is possible for those with means, it’s the hottest, priciest, and most crowded time of year for traveling. For lower-income families, the availability of formal and informal municipal resources–public swimming pools, kids’ day camps at city parks, and air-conditioned public libraries–is critical. For tens of thousands of Los Angeles-area kids, poverty doesn’t take a summer vacation. The LAUSD academic calendar also plays a role in making summer a tough sprint for families. The long winter break is offset by making the summer break short, just over two months long, with school ending June 9 and starting up again August 15. So while the fabled and possibly archaic family summer vacation is possible for those with means, it’s the hottest, priciest, and most crowded time of year for travelling. It’s taken our family three years of practice to finally figure out how to make this unconventional school schedule work for us. We did this by giving up on a conventional week of summer vacation; we might get a long weekend or two if we’re lucky. Instead, we opt for vacation during the tail end of winter break, after the holidays, when most other school districts are back in session and airfares and hotel prices drop significantly. But our coping strategy is under fire. The LAUSD Board, in their infinite wisdom, has considered changing the academic calendar as the solution to several of their administrative woes. You see, other school districts start at a far more conventional time: after Labor Day. Not only do some board members observe other school districts with a jealous eye, but they are also under the impression that a later start will result in lower air conditioning usage and, hence, lower energy costs district-wide. This past fall, it looked like a move towards a more traditional start, one week later in 2017 and an additional week later in 2018, was going to pass. In December, however, forces far greater than Computer Camp took hold, shocking the school board into reversing their position—and reverting (for now) to the calendar with the two-month summer break and the three-week winter break. Why? For two big reasons. First, the teacher’s union likes the status quo. Second, changing to a calendar with a shorter winter break would result in more student absences, since a considerable number of parents would still yank their kids out of school for a few days for holiday-time visits to relatives and winter vacation destinations. These additional absences would result in LAUSD losing some of its funding from the State of California, which allocates resources based on average daily attendance. But the scheduling issue remains white-hot. The board’s decision on the calendar was so divisive that the board President abstained—yes, abstained—when the academic calendar issue came before them. So while the calendar is set for the school year beginning this coming August, the board has yet to decide on the calendars for the 2018-19 school year and beyond. I wonder if this lack of leadership, leading to unnecessary uncertainty for parents, would even matter if we had the informal, cheap, carefree, drop-in nature of the summer camp I remember. But I recognize that in our current era of instant access and gratification, kids like our daughter might not know what to do with the unstructured fun I had when I was a kid. None of today’s summer camp options offer any time for being lazy or hazy—there’s only a short break before your next camp activity starts at 10:10 a.m.
What memories will she have? What sport will she remember playing that didn’t come with rules or equipment? And with her day’s activities lined up on a scheduling grid, will she even have the time to reflect on her summer music soundtrack? As for me, Gerry Rafferty’s sax solo will always remind me of those slow and easy summers, with the click-clack of a table hockey puck adding some percussion. Just don’t tell the Beach Boys. David Gershwin is a Los Angeles-based public affairs consultant, Zócalo Public Square board member, and teaching fellow at UCLA Anderson School of Management. Primary Editor: Joe Mathews. Secondary Editor: Sara Catania.